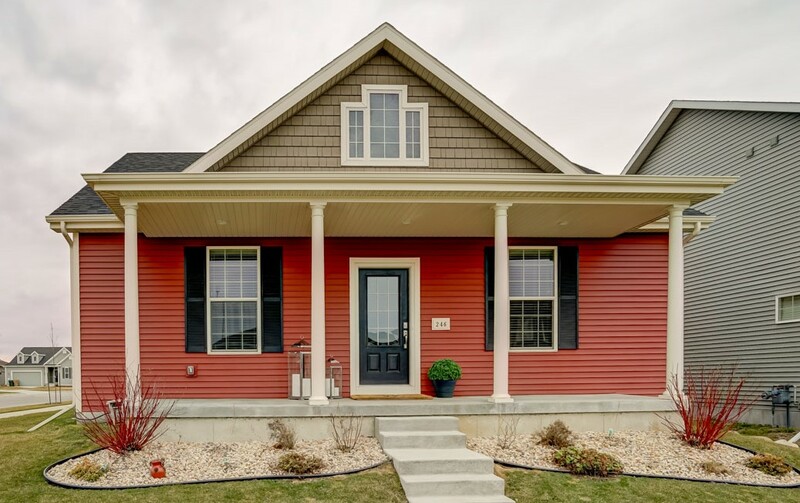 The first thing you notice when you pull up to 246 Blooming Leaf Way is the pure Americana feel of this rustic-red 4-bedroom ranch style home with its large front porch. As spring turns to summer, you’ll notice the perennials coming to life in the landscaped yard. 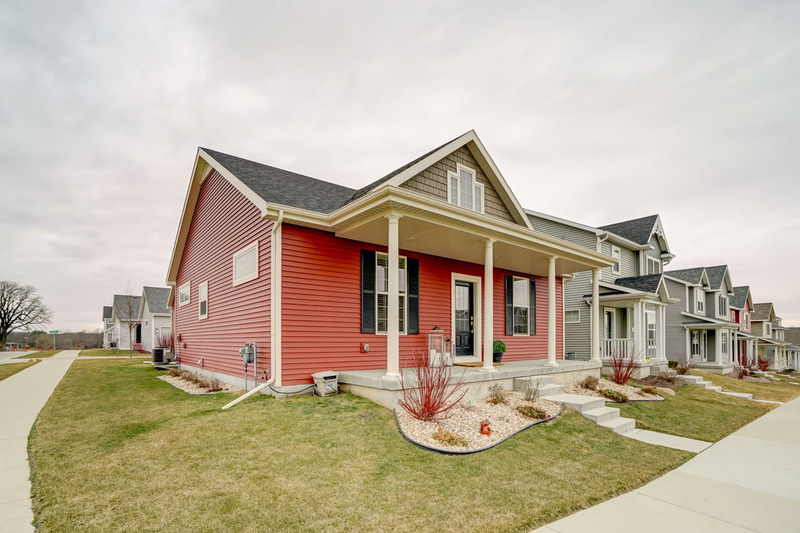 And the corner lot offers plenty of space for kids to play on the wrap-around lawn or wide sidewalks — perfect for chalk drawings or a good old-fashioned game of hopscotch. But the interior is where this home really comes to life. The front entry is open and airy, marked by gray wood-tone flooring. An open staircase leads to the lower-level and an adjacent hallway leads to the kitchen and great room. Just inside the front door is a handy coat closet. 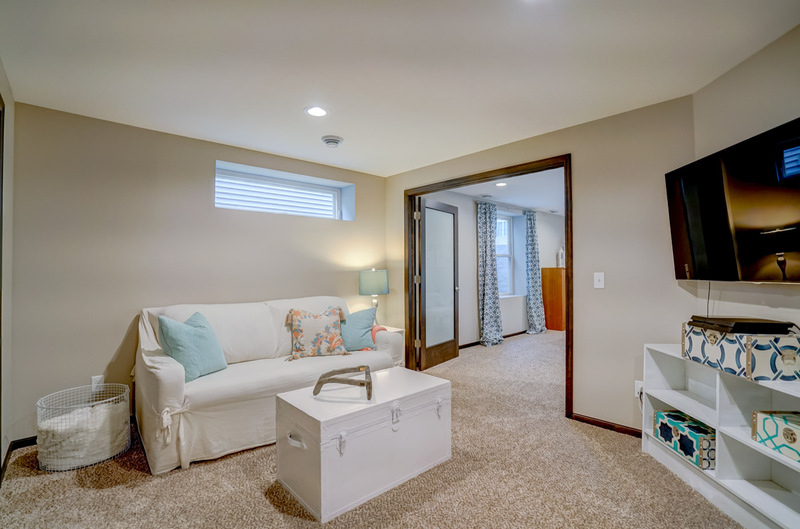 Families will appreciate the split-bedroom design of this Veridian home — the perfect marriage of privacy and accessibility. 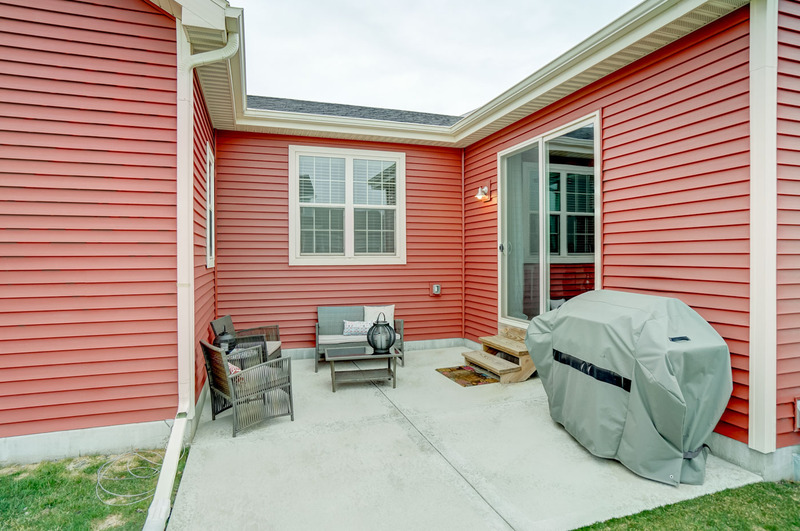 You’ll find the first 2 bedrooms on either side of the front door. Like the hallway, they’re painted in an appealing greige. 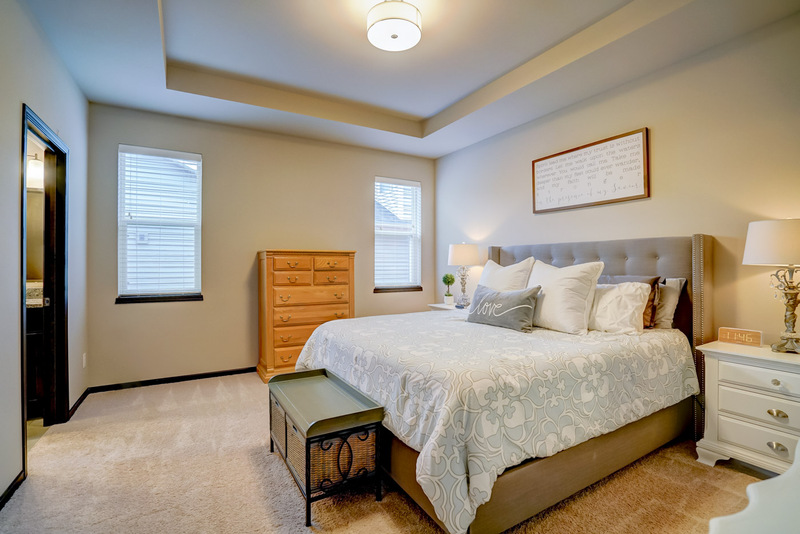 The 9-foot ceilings give the rooms an open feel while the neutral carpeting adds warmth. Both have nice sized closets — one slightly larger than the other. These rooms would be perfect for kids, guests, or even an office. Just past the bedrooms, there’s a full bath — with a nice countertop and plenty of cabinet storage. Right outside, there’s a hallway closet with shelves — great for linens or your kitchen pantry overflow. A few more steps takes you into the heart of the home — the kitchen and great room. 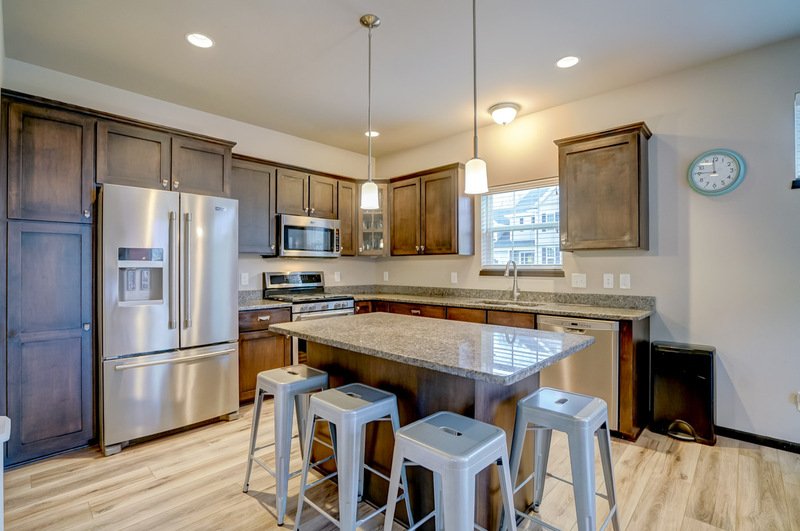 On your left, the large open kitchen is outfitted with high-end Maytag appliances, a gas range, and granite countertops. Soft-closing rich wood cabinets with upgraded pulls provide natural beauty — and plenty of storage space. A corner cabinet with a glass front is the perfect place for glassware, bowls or other things you actually want your guests to see. The island breakfast bar seats 4. But there’s also a generous dining area with western-facing sliding glass doors — offering a spectacular view of the sunset. In warmer months, you might even want to take — or make — your meal outside on the in-set patio. A direct gas line to the grill makes barbecuing a breeze, even while you and your guests are protected from the actual wind! What a great place to entertain — or just relax. Across from the kitchen is a spacious great room. Here, 2 large windows frame a space already outfitted with hardware to mount your TV — for family movie-watching or to catch your favorite talk show while cooking dinner. This room also offers the perfect vantage point for viewing those nightly sunsets. Down a short hallway, just inside the back door, there’s a mudroom and laundry, equipped with a modern Whirlpool washer and dryer. From here, you can access the 2-car plus garage. There’s room for 2 vehicles with generous storage or workspace along the side. And the garage is conveniently accessed by an alley right behind the house. Back inside, just beyond the mudroom, you’ll find the large master suite. This bedroom is spacious and well-lit — accented with a tray ceiling. The attached bath features 2 unique rectangular undermount sinks set into an executive height granite counter. There’s also a large shower. A huge walk-in closet is the final touch. If this wasn’t enough reason to love this house, there’s also a finished lower-level. The front staircase leads down to a door that opens (or closes to muffle noise from one side or the other) into a rec room area. 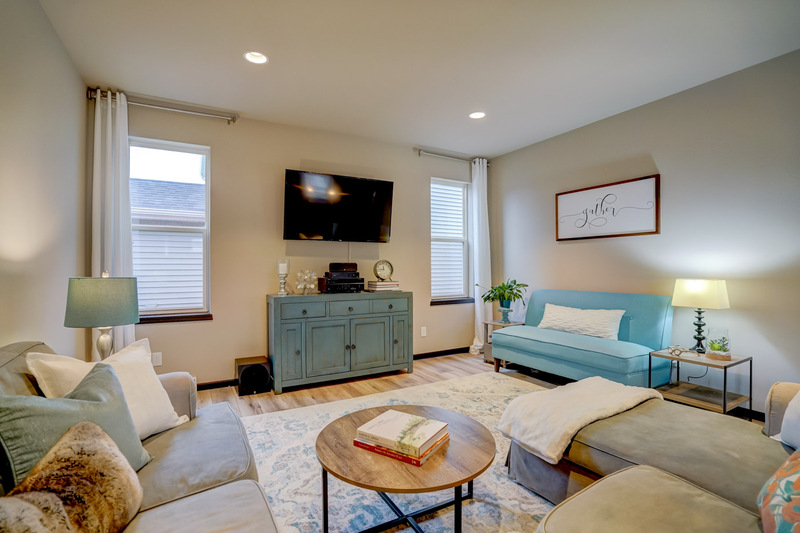 There’s a comfy pull-out couch — with a full/queen memory foam mattress, that comes with the home — to curl up and watch TV, read a book, or chat with family and friends. Another part of the room provides a perfect space for a desk or play area. The lower-level boasts a full bath with a shower ­and lots of shelving. The floors are luxury vinyl and the room is highlighted by a vessel sink mounted atop a beautiful rich wood vanity cabinet. 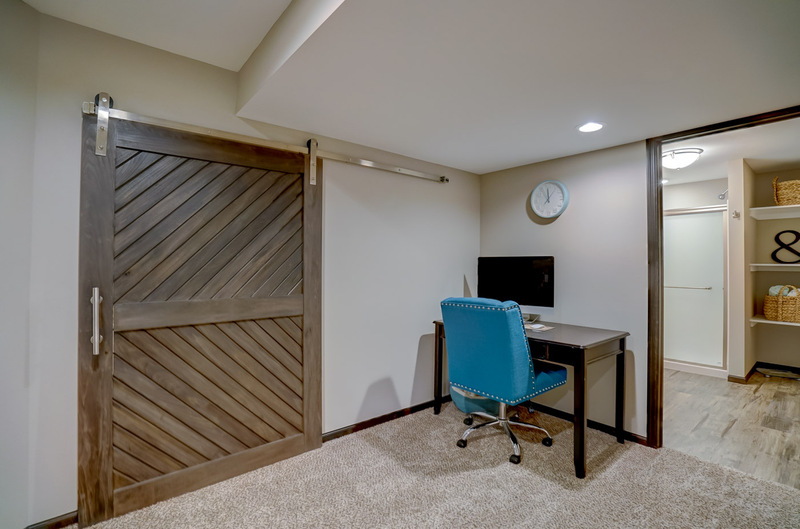 Double French doors of dark wood and frosted glass open to a huge 4th bedroom, offering a variety of options — from guest room to playroom, home office, or the perfect room for a teenager wanting some space apart from younger siblings. The room has a large egress window and an expansive walk-in closet — the ideal spot for kids playing hide and seek. The lower-level also has a huge storage and mechanical room. And for fitness buffs, the pièce de résistance can be found behind a custom-made barn door accessed from the rec room. The doors slide open to reveal a great home workout room. You can walk the treadmill (which stays with the house) or lift weights. And there’s plenty of space here to set up your preferred fitness equipment. You’ll never have to leave home to get your workout in again! But if you have kids, they’ll want to get their exercise at the nearby Sugar Maple Park, just a couple blocks away. Close enough for the older ones to ride their bikes, the park is full of playground equipment and lots of room to run. And on summer nights, families gather here to watch movies. And finally, don’t let the Verona address of this house fool you. Blooming Leaf Way is actually right off West Mineral Point Road, just east of Blackhawk Church. Casual passers-by would think they were in Middleton, with farms and open spaces nearby. It’s conveniently located near Middleton, West Towne Mall, Greenway Station, and the Beltline — with stores, restaurants, churches and schools all a stone’s throw away.